Originally intended for the Civil Service, Mr. Peacock's talent was so conspicuous that at an early age he made up his mind to take up painting as his life work. He received great encouragement from his father, who joined a class in the South Lambeth Art Schools with him when the son was but fourteen years old. Here he was accustomed to work two evenings a week while studying for his examinations in the daytime. He was eighteen when his work attracted the attention of John Pettie, who induced the youth to devote himself solely to his art. A year at the St. John's Wood Art School was followed by a course at the Royal Academy Schools, which he entered in 1887. In 1890 he was able to support himself by teaching and by illustrating books. Working in the evenings, he gained the Gold Medal and the Travelling Studentship in Historical Painting with his picture, " Victory," and for nearly two years he travelled abroad studying and painting. From Switzerland he sent a landscape which was exhibited in the Institute of Painters in Oil Colours, and from Italy his picture. " Oxen Ploughing," which was a feature of the Royal Academy Exhibition in 1893.
" Sisters" was painted in 1900, and was presented to the nation by the artist. It is interesting to note that the elder sister is now the painter's wife, while the younger is the girl shown in " Ethel." 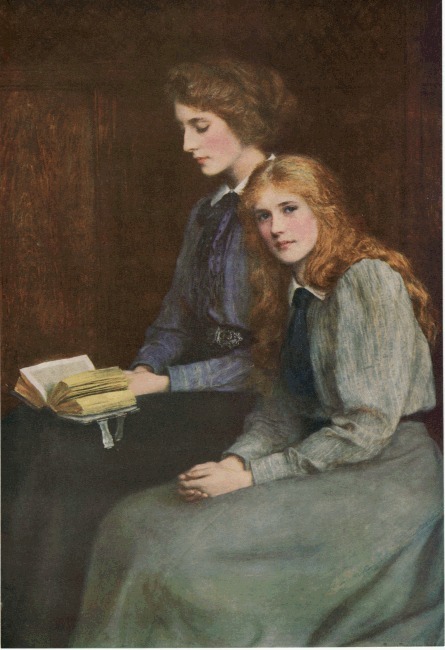 The great charm of this painting lies in its colour scheme, The grey shades of the dresses contrast agreeably with the mahogany brown of the background, both of which serve to display advantageously the complexions of the two girls and the golden and rich brown hues of their hair. "Both Sides of the Border"